Enjoy one of the Best Hotels in Orlando, FloridaWhen you're looking for hotels in Orlando, Florida, location is usually the top priority. 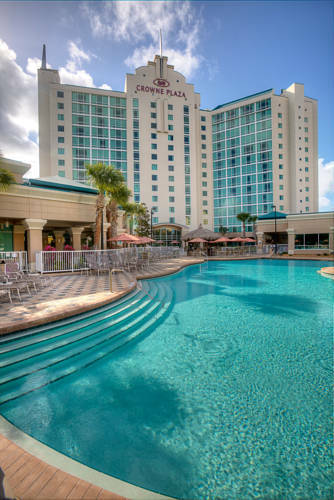 Whether you're here for business meetings or to visit Disney World , Universal Studios or Sea World, our hotel's in the midst of everything that this unique city has to offer.Just because the award-winning Crowne Plaza Orlando - Universal hotel is near theme parks doesn't mean it can't cater to business travelers. We're proud to offer nearly 7,000 square feet of space and standards such as a Crowne Meetings Director and a Guaranteed Wake-Up Call. Our Orlando hotel's location is near the Orange County Convention Center, Lockheed Martin, Darden and the University of Central Florida.Orlando is synonymous with family fun and our hotel is perfectly located in the midst of everything. Be sure to hop on the I-Ride Trolley that stops at key spots like City Walk, Islands of Adventure, Universal Studios, Aquatica and Sea World. Our hotel's location is also convenient to Disney World , Hollywood Studios and the Mall at Millenia, where you can shop at great stores like Bloomingdale's and Neiman Marcus.As a certified green hotel on Universal Blvd, we're already a top place to stay, but we also offer a large outdoor pool, spa services, a gift shop, Cafe Del Sol and Elements Bar & Grille. Make your plans now to visit our hotel in Orlando, FL to enjoy the best stay possible. Refresh yourself with delectable drinks and tapas at our Aqua Tiki Bar, offering frozen drinks, beer, wine and light fare. Take in a game or a match on two high definition plasma TVs and the kids never have to leave the pool! Deep dish pizza, pasta, salads sandwiches and more! Restaurant and Bakery serving breakfast, lunch and dinner. Offers fresh seafood, aged steaks and prime rib. The Studio is located in the hotel's atrium area on the ground level. In the hotel's atrium a space is located below the Mezzanine level that is ground level totaling 1,195 square feet. The Mezzanine AB can be divided into 2 separate meeting rooms. The Atrium Boardroom is located on the groud level in the hotel's atrium area. Located in the convention center with an entrance and foyer directly from the parking lot. This facility is 3,729 combined sq ft but is divisible equally by airwalls into three salons. One of those salons is divisible again into two smaller salons still. The Plaza Board Room is located on the ground level across from our Crowne Ballroom. The courtyard is encompassed by the entire lobby and pool level of the hotel. This enclosed creative space offers spectacular nighttime views of the pool, daytime events showered in FL sunshine and unique breaks during intensive training or meetings. The Executive Lounge offers a creative and unique experience for your meeting or reception with a wonderful view of the area. Children's program - Outdoor pool and arcade featuring air hockey and table tennis. Lush tropical landscape enhance the existing oaks and tall native pines that border the resort. Multiple Awards won in our first year testify to the quality of our service and condition of our course. 5 sets of tees that allow you to customize your game. The Mall at Millenia offers an extraordinary experience, for those of us who call Orlando home or those visiting Orlando for business or pleasure. Visitors from around the globe are invited to add world-class shopping to the list of Orlando attractions. A place where you can elevate your dining experience at restaurants offering everything from casual fare to haute cuisine, shop and watch a movie at the Regal 3-D Imax theater. The largest outlet shopping destination in the Southeast, Prime Outlets Orlando has over 200 hundred stores including many of the best brand names in the nation. Embrace this fun-filled escape, brimming with unique boutiques, culinary surprises and lively entertainment. There s so much for you to explore no two visits will ever be the same. The Walt Disney World Resort features four world-renowned theme parks, twenty-four on-site resorts, two water parks, four mini-golf courses in two locations, an interactive/video game park, a shopping and nighttime entertainment area and more. The first aquatic, fitness and hotel complex, the Justus Aquatic Center was the largest indoor competitive swimming facility in the southeast. It featured a first of its kind hydraulically retractable roof. It also featured a workout/ wellness center.